Attack coach Alex King has played down recent stories suggesting George North is frustrated with Saints’ style of play. North, who is now preparing for Wales’ Six Nations opener in Ireland on Sunday, has recently said that he feels like he has been “carrying the ball into the wall” at times at his club this season. 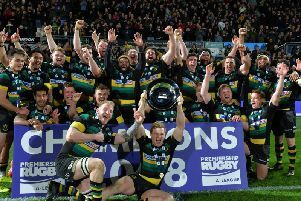 The 23-year-old has scored just three times for Saints during the current campaign, but did produce a performance Jim Mallinder labelled one of the wing’s best in Northampton colours in last month’s Champions Cup win at Scarelts. And King has no worries about North, stressing that the player would speak to the coaches if he wasn’t happy with life at Franklin’s Gardens. “I’ve got a good relationship with George and what you read in the press isn’t always the genuine article,” King said. And the former Scarlets star also said is it nice to step away from his club to “get a different stimulus”. But King said: “I thought his game against the Scarlets was his best of the season. “He got on the ball a lot, especially in that first half, he scored a cracking try in the second and he’s gone to Wales full of confidence that his game has come back to where he wants it to be.